If you’ve listened to part 1 of our latest Unhallowed Metropolis game, you’ve undoubtedly heard me geeking the hell out about some 19th century costuming book. 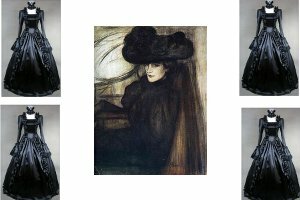 In case your interested where all of the costume inspirations came from, check out the full book on Archive.Org Fancy Dresses Described: Or, What to Wear at Fancy Balls. For anyone interested in the history of fashion or costuming, it’s an invaluable resource. Having the chance to really dig into some of the social aspects of the Unhallowed Metropolis setting also solidified my love of the game. Other women my age might recognize where my love of all things Victorian-era comes from – Samantha was totally my favorite American Girl Doll. I read all of her books, and even bought a book all about Victorian etiquette and cooking. To this day, if I’m setting a table for a formal occasion, I set it the way Samantha’s book described a proper Victorian table setting. And while I’m far too old for the American Girl series these days, the love of the era that Samantha instilled in me is alive and well, it turns out. I hadn’t thought much of it, until I stumbled upon Fancy Dresses Described while trying to find a description for an appropriate costume for Moira, as we had a head’s up that a masquerade ball would be part of the upcoming plot. Ask Billy how obsessed I was about this book for an entire evening – I practically read it cover to cover. For more thoughts on costuming Unhallowed Metropolis specifically, and all of your characters in general, keep an eye on Gaming as Women, where I’ll have a post up on the subject later this week!